Heavy Feather Review - it's here! My story "Patience Is the Most Passive Discipline" is in the newest issue (issue 2.2) of Heavy Feather Review. This is my first time to be published in this journal, and I hope to have my work featured in another issue in the future. Jason Teal is a wonderful editor, and the journal arrived in the mail today! It looks fantastic. Special thanks to all my friends and my mom who bought the issue as well. A busy 2013 so far; in my writing life, this is maybe the busiest year yet, which makes me happy. In May, Notice had its first public reading at the Coolidge Corner branch of the Brookline Public Library. I got a lot of really great feedback from the play, including constructive criticism, all of which is being considered as I make all necessary revisions. Daniel Bourque, who directed the reading, and I have a view to co-produce Notice ourselves, and we're in the very early stages of planning this. It's a long road to stage it ourselves, but it's exciting nonetheless. Dan's a seasoned director, and there are a number of theater spaces in the Boston area that we have our eyes on. Coming up on July 26 is a public reading of my next play, Our Home in the Country. It will be held at the Salem Athenaeum, who were kind enough to ask me to fill one of the weekly slots for their summer salon series. I'm honored to be a part of the Athenaeum, and looking forward to having the work read in front of their audience as an important step in getting this play up on its feet. This month, my short story "Patience is the Most Passive Discipline" will appear in Heavy Feather Review issue 2.2. The print issue is available for purchase. Thanks to editors Jason and Nathan for having me on board for this issue. I'm still writing new short stories and sending them to journals and contests, and work on a new novel is still underway, though work that pertains to plays and short stories sometimes interrupts and grabs my attention momentarily. There are other long-term plans, too, that will have to remain plans until their time in the queue comes up. For now, the "One thing at a time" mantra is the only thing that is keeping me productive. That and an inordinate amount of caffeine (just don't tell my doctor). My play Notice will receive its first public reading on May 25th in Brookline, Mass. Will post details as the date approaches for friends in the area who are interested in attending. 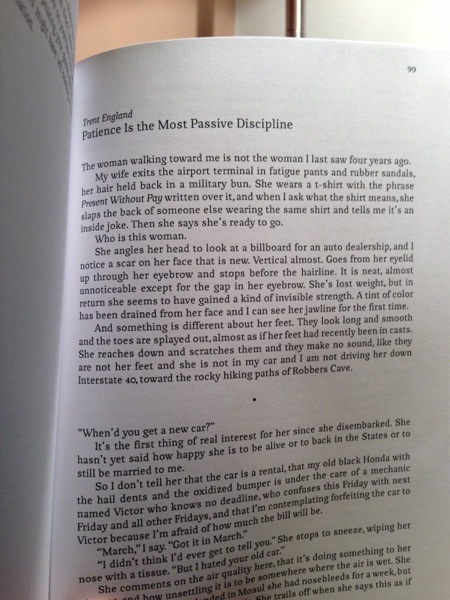 My short story "Patience is the Most Passive Discipline" will be published in Heavy Feather Review July 2013 as an e-book or print-on-demand. So, those of you with Nooks or Kindles can download the issue or if you have access to a print-on-demand kiosk you can do that as well. Will post links/details this summer. My newest published short story, "Do You Always Want to Move Me?" is now online at Wigleaf, as is the accompanying postcard. My first play, Notice, will receive its first staged reading in the spring of 2013 in Boston.